The daffodils have bloomed and the weather is getting warmer (we hope) which means Easter weekend is just around the corner (25th-28th March). Many traditions take place during this weekend including Easter egg hunts and family get-togethers. But have you thought about adding a professional finishing touch to make your Easter home-cooked meal extra special? You may have heard of a blowtorch, but have you ever used one? It’s traditionally used for browning sugar on top of gorgeously creamy crème brûlées, but the fun doesn’t end there. 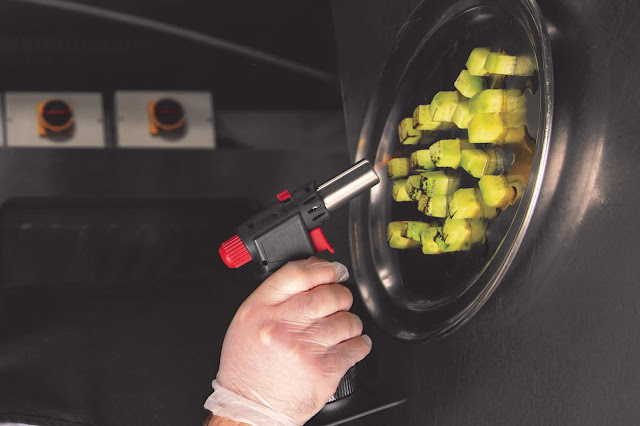 Take a look at our article on how to use a kitchen blowtorch to give your food a perfect colour without turning the grill on. Slow roasting may be one of the easiest ways to cook lamb, which is nice when you’re busy taking part in an Easter egg hunt. As it’s slowly cooking, the juices tenderise the meat until it’s so succulent it falls off your fork. But if you slow roast does that mean you have to sacrifice the crunch? Definitely not. The recipe below shows you how to use the intense controlled heat of the blow torch to char the outer layer of the lamb for a satisfyingly crispy finish. 1. Let your lamb shanks stand at room temperature for about 15-20 minutes so they cook evenly. 2. To make the salt-crust dough mix the flour and salt together in a large bowl. Slowly add the egg whites and 400ml water, and stir together with a wooden spoon to form a firm dough – add a little more water if needed. 3. Tip the dough onto a lightly floured surface and knead for 10 minutes or until smooth. Wrap in cling film and set the dough aside to rest for 1 hour. You can also make the dough in a freestanding mixer with a dough hook attachment to give your arms a rest. 4. Heat the oven to 160°C/140°C fan/gas mark 3. Line a baking tray with parchment paper and divide the dough into 4 even-sized pieces. Lightly sprinkle some flour on a clean surface so you’re dough doesn’t stick to the worktop and roll each piece into a circle almost 1cm thick. 5. Place a lamb shank in the centre of each disc of dough and tuck 2 garlic cloves underneath. Brush the edge of the dough with a little water, then gather it up and around the lamb shank, leaving the bone exposed. 6. Make sure all the meat is covered and the pastry is well sealed. 7. Put all the lamb shanks onto the lined tray and bake in the oven for 3 hours 30 minutes, by which time the crust will have turned a dark brown. 8. Once the lamb is cooked, leave it to rest for 30 minutes so the juices settle and create a rich flavour. Using a bread knife, open the crust and very carefully remove the shanks and the softened garlic cloves, then discard the crust. 9. Place the shanks on a baking tray and drizzle with a little oil. Use your blowtorch to give the lamb a crisp and toasty finish. 10. Serve with the garlic cloves and your favourite array of vegetables. If you’re a fan of the classic bread and butter pudding you’ll love this recipe. It’s a great way to use leftover hot cross buns without getting them stuck in the toaster. Use your kitchen blowtorch to melt a layer of golden caster sugar to create a delicious caramel sauce that melts in your mouth. 1. Heat the oven to 170°C/150°C fan/gas mark 3. Warm the cream and milk in a medium sized saucepan over a gentle heat until steam starts to rise. 2. Whisk the eggs, sugar and vanilla together with a fork in a large bowl until a light foam gathers around the edge, then gradually add the warm cream mixture. 3. Halve the buns and cover them with the butter. Arrange the halves in a large shallow ovenproof dish, dot with the marzipan and brush the marmalade on top. 4. Pour the cream mixture over the top of the buns and set aside to soak for 15 minutes. Press the buns down into the custard mixture as they soften so the mixture covers every inch of the buns. 5. Bake for 50 minutes until set, then remove and allow to stand for 10 minutes. 6. Sprinkle the golden caster sugar over the top and caramelise it using your blow torch until golden brown.